We’re well on track for a great show again, and can now give a sneak peak at just some of the games we’re expecting for the show. Usual disclaimer of course – there is a chance that some of these games may change between now and the day of the show, but we’ll try and keep the list updated as any changes occur over the next few weeks. So far the list contains 100 games, ranging from some classic early 1970 titles, through to the latest titles from Stern and Jersey Jack Pinball. 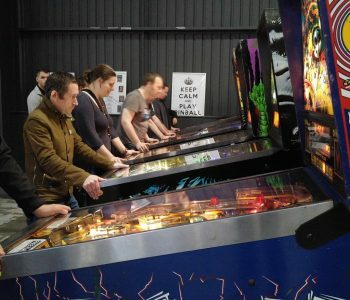 The range and depth of games here wouldn’t be possible without the tremendous support of the pinball community around the UK, so a sincere thanks to everyone who has generously pledged a table. Breaking down the list, we can see that a majority of games are from Bally/Williams, who were the dominant manufacturer during the 80’s and 90’s. When Williams closed down in 1999 Stern was the only remaining manufacturer, but the strength of their games meant that pinball survived through some difficult years for the industry. There should be a good representation of Stern games at the show too, including some of the very latest titles. 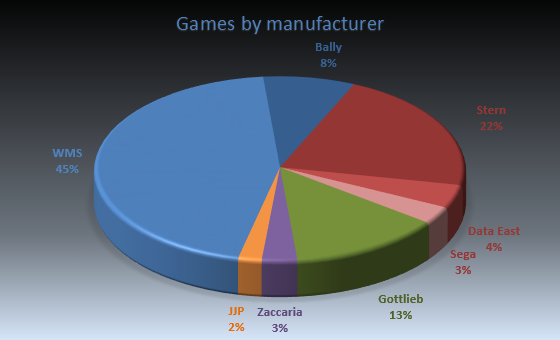 What’s great to see as well though are a good percentage of titles that are rarely seen, including some great games from Gottlieb, Zaccaria and Jersey Jack Pinball – one of the newer manufacturers to emerge in recent years, as pinball starts to make it’s comeback! Follow our updates on Facebook for further exciting announcements as the show draws closer!